Zoho CRM is available in 25 languages. You can select the language that you require by navigating to Setup > General > Personal Settings in your CRM. In the section Locale Information, click the edit icon. Choose the language that you wish to use from the list in the Language option. In any business environment, there are terms such as Leads, Deals, Campaigns, Invoices, etc. Following are the list of such terms and their definitions as used in Zoho CRM. You can refer to more such terms in the Zoho CRM's Glossary. Leads are the unqualified contacts or sales opportunities in your business. They are the raw details gathered about individuals or representatives of organizations collected from trade shows, seminars, advertisements and other marketing campaigns. A lead goes through the follow-up process by sales reps and when qualified, they're converted into an account, contact and deal (opportunity) in Zoho CRM. Accounts are the companies or departments within a company with which you have business dealings. 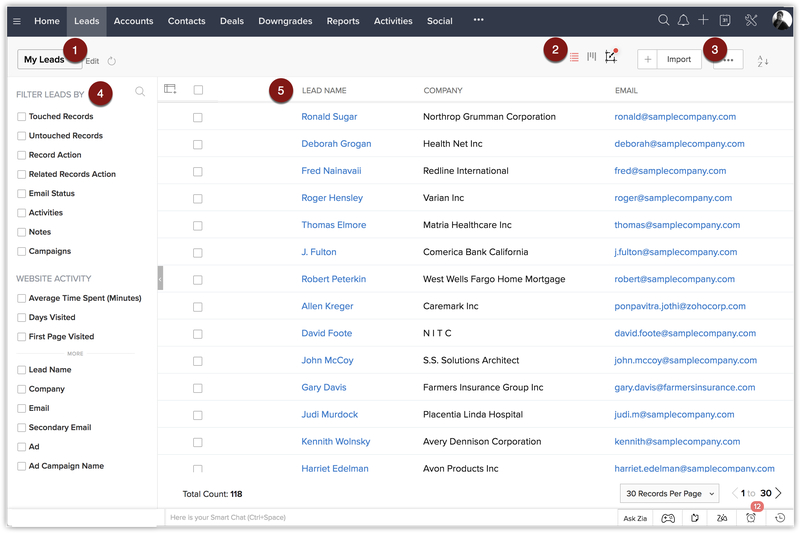 In Zoho CRM, single or multiple contacts can be associated to an account. In a typical B2B scenario (one business selling products or services to another business) accounts play a major role in keeping track of the important company information. Contacts are the people in an organization with whom your company has business communications in pursuit of business opportunities. Some of these contacts may belong to different departments in a company or multiple contacts of the same company. CRM contacts are typically converted from qualified leads, imported from an existing list or added individually based on the business relationship with the associated company. Deals are the business deals with organizations (B2B) or with people (B2C), which generate real revenue for your organization. It evolves through different sales stages such as Prospecting, Qualification, Needs Analysis, Value Proposition etc. before it is actually a deal, lost or won. Leads that show interest in your business can be directly converted to opportunities that represent potential sale. Forecasts are the factual insights needed for making smart business decisions and anticipating future sales. They provide a personalized view of your real time business for tracking and fine-tuning the sales process in your organization. Campaigns in Zoho CRM, provides a platform to organize and record the overall cost for marketing campaigns. It helps in marking the various stages, importing targeted contacts, associating all the tasks, events, and calls related to the campaign. Also, it gives a detailed view of all marketing campaigns an individual customer has been a part of. Price Books are the agreed price for selling a product to a customer. Based on the agreed terms, the prices can even vary for different customers. The unit price which is the price fixed by the manufacturer for the product and the list price which is the sellers' price can be quoted in the price books. Additionally, the discount ranges can be defined. Vendors are the companies, individuals or contractors from whom your organization procures products and services. The vendor details stored in Zoho CRM can provide better visibility on the vendors or suppliers for the future procurement of products. Quotes are legal agreements between customers and vendors to deliver the requested product within the specified time at the agreed price. A quote can be converted into a Sales Order or Invoice with a single click. Templates can also be created based on the quote details and can be sent to the customer. Sales Orders are the confirmation of sales generated after the customer sends a purchase order based on your quotes. A quote can be converted into a Sales Order with a single click. Purchase Orders are legally bound order-placement documents for procuring products or services from vendors. Each product can have a different reorder level to trigger the creation of a new purchase order. Invoices are bills issued by the vendor to the customers along with the goods or services with the purpose of receiving payments. A quote can be converted into a Sales Order or Invoice with a single click. In Zoho CRM, data is categorized into groups or divisions based on similarity. Each division that has similar data is called a "module". For example Leads is a module that contains all your business leads' details. Contacts, Accounts, Deals, Quotes etc are other examples of modules. In Zoho CRM, modules are of two major kinds - default modules and custom (or user-generated) modules. "Record" is the generic name given to any entry made in a module. For example, if there are ten leads in the Leads module, each lead is a record. If there are 10 contacts in the Contacts module, each contact is a record and so on. When you open your Zoho CRM account, the first screen that you see is the home page. Here, you can take a quick glance at the progress of your CRM activities. It is a dashboard that contains components from different modules, and you can customize the home tab by specifying which component to include. 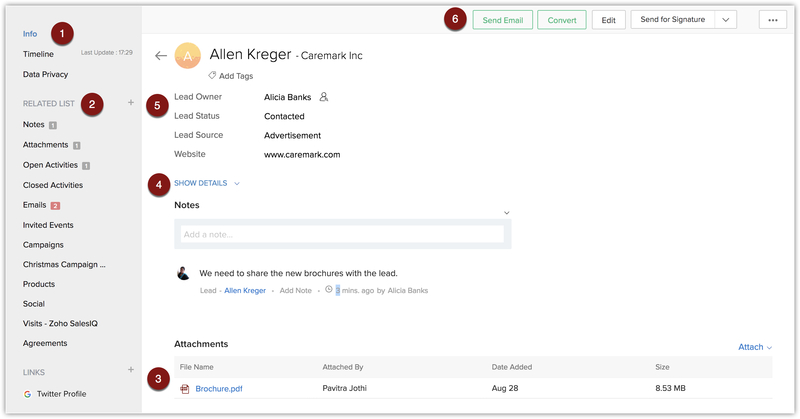 Icons for Search, Feeds notifications, adding records, Zoho CRM calendar, MailMagnet, Setup. Components in the customized view. CRM footer with Ask Zia, Gamescope, Sticky notes, Zia notifications Activity Reminders and Recent Items icons. Different types of Views - List, Kanban and Canvas. More options - Mass actions, Autoresponders, etc. based on the module. List of records in the selected module. Info, Timeline and Data Privacy(when GDPR Compliance settings is enabled). Option to view the all the information. Options to perform on the record - sending email, converting lead, editing, etc. You can configure the settings of your CRM account by clicking on the Setup icon present in the header tab. 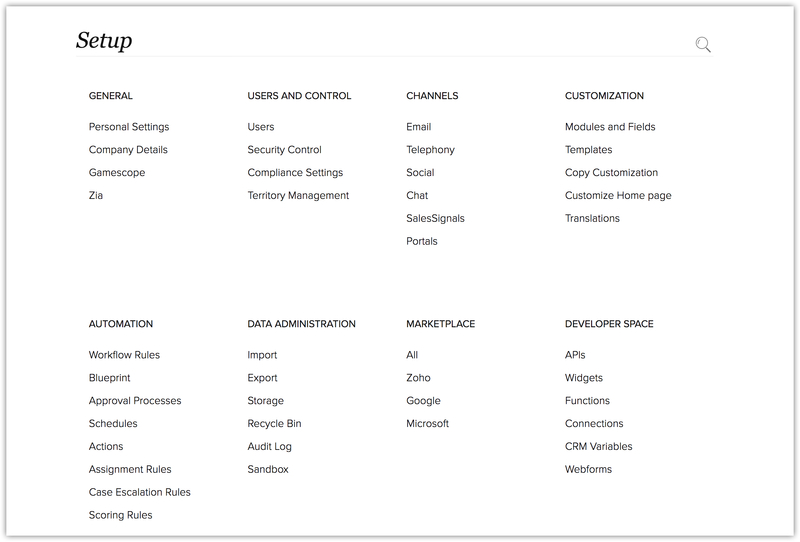 Zoho CRM contains setup options for configuring General settings, Users and Control, Channels, Customization, Automation, Data Administration, Marketplace, and Developer Space. To begin with, you can configure the General settings initially, that will allow you to fill in your personal details and your company's details. Navigate to Setup > General to access the General settings. The Sales Force Automation solution helps you to track leads, prospects, business opportunities and close more deals in less time. Additionally, you can effectively use the existing customer data for future up-selling and cross-selling opportunities. Zoho CRM's Inventory Management helps you to achieve the seamless integration between pre-sales and post-sales activities in a single application. In addition, you can also track procurement of goods or services from the preferred list of vendors. 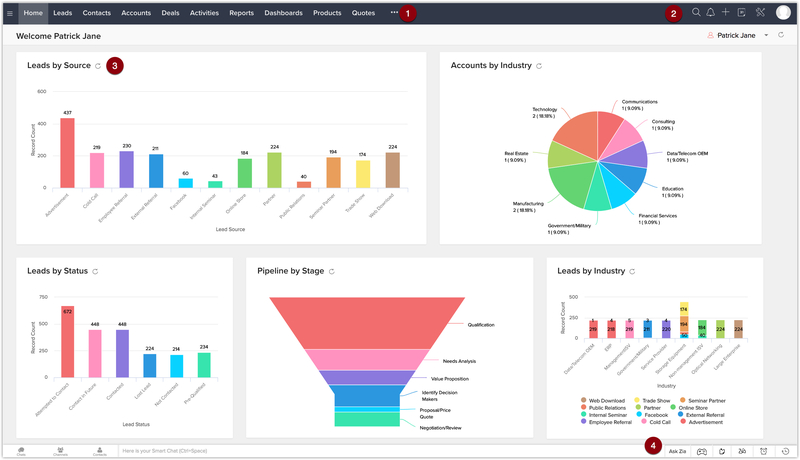 The Reports & Dashboards functionality helps you to visualize the sales pipeline, business performance, trends and schedule reports to the specified users including non-Zoho CRM users. Additionally, you can share reports and dashboards with colleagues. You can keep all business related activities organized with the help of the Tasks, Events, and Call logs in Zoho CRM. Setting reminders, recurring tasks & events, and sharing them with others is easy with this functionality.